Cloud technologies started becoming relevant about ten years ago, and now more and more businesses have been moving their IT environments from on-prem hardware to the cloud. With many organizations adopting a “cloud first” strategy, it is clear that we are heading into a time where it will be the norm for companies to have the majority of their IT environment in the cloud instead of on-prem. This thought reminded me of a Winston Churchill quote, in which he said, “Now this is not the end. It is not even the beginning of the end. 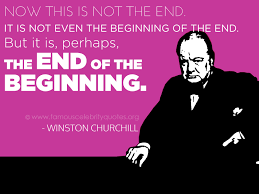 But it is, perhaps, the end of the beginning.” When Churchill said this, he was referring to World War 2, but this quote also applies to how this is the end of the beginning of the adoption of cloud technologies. Sooner rather than later, all companies’ IT environments will have some sort of integration with cloud technologies, whether their entire environment is moved to the cloud, or they run a hybrid environment. So which cloud is right for you? There are a number of different cloud options available, each with their own strengths and weaknesses. The biggest players at the moment areMicrosoft Azure, Amazon Web Services (AWS), and Google Cloud Platform. Azure is revered for its very user friendly platform, the way it handles and deploys web applications into the cloud, and how it is built under the Evergreen model which means it is always changing and growing. AWS has more cost effective storage options, but its user interface (UI) is much tougher to handle especially for those with minimal cloud experience. Google made a late entry to the cloud game, but has tried to come in and win business by offering the lowest prices of the three, but with a less expansive platform and to date not as much of an investment in the cloud business as Microsoft and Amazon. There’s no doubt that the cloud has become both a disruptive and enabling technology. Making the move to the cloud is a big decision for any business. It requires a lot of planning and asking the right questions. I encourage you to check out my 3-part FAQ blog series on “Choosing Your Connection to the Cloud”. It should help you start thinking about the right questions to ask and get started with your due diligence. Here at Daymark, we have developed deep expertise with Microsoft cloud solutions. We are a Microsoft Silver Partner and a Tier 1 Cloud Solution Provider with a high degree of Office 365 and Azure technical knowledge. Just this month, we were named to Microsoft’s Managed Partner Program – an elite program reserved for the only the top 2% of Microsoft’s partners.